Movie Review: Trumbo (2015) | Generation Film! In the realm of Hollywood, journalism, and first-amendment pioneer circles, Dalton Trumbo—one of the infamous Hollywood ten brought before the House Un-American Activities Committee in 1947 for communist affiliations—has been canonized as some sort of civil liberties saint. Creating a heroic mythos of a man blacklisted from being able to create does a disservice to the context of history, but also does a disservice to understanding a complex, inventive, and flawed human being. Trumbo had daily battling tensions between his communist ideals and capitalist opportunism (evidence exists in his overtly nationalist screenplay for Mervyn LeRoy’s Thirty Seconds Over Tokyo (1944)); he remained a Stalinist sympathizer even though he personally suspected he was a monster (wrote to a comrade that he “wasn’t surprised” about Khrushchev’s 1956 speech); he willfully censored his pacifist novel Johnny Get Your Gun and reported requests for it to the FBI on the grounds that fans were “acting political;” and he even used his influence in Hollywood to censor and stop anti-communist films from being made. HUAC was indeed a grave injustice of paranoia and privacy, but a civil libertarian Trumbo was certainly not. Instead of creating a portrait of a flawed man standing in the right, director Jay Roach has fashioned a mustachioed cartoonish archetype—an artificial drawing of an almost saintly man without doubt, anxiety, or creative struggle, whose every word seems worthy to grace the littered bumper of a car. 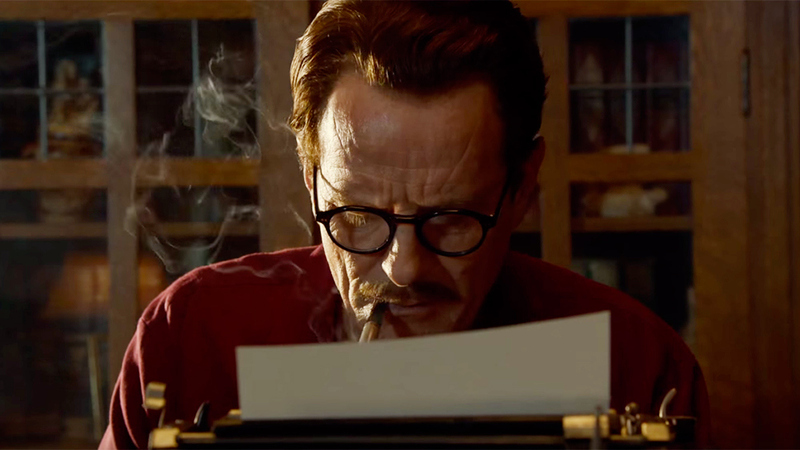 Though the message—that we should never punish people for what they believe—is a timeless one (and one that could use some adherence to in our modern day), Trumbo’s saccharine and leaden approach dilutes its intention and delivers a rather mindless and diminutive film that even the famed screenwriter himself would have demanded several more rewrites before shooting. Trumbo’s based on the flawed hagiographic and rightly criticized biography from Bruce Cook; a clumsy account that’s based on the screenwriter’s own selective and flawed narrative. And unfortunately John McNamara’s adaptation of the material leads to an exceptionally timid, thoroughly dense, and particularly gauche interpretation of Dalton Trumbo (Bryan Cranston) as it gets distracted by names, dates, and events while completely missing the dramatic impact of each. The film speedily and superficially encompasses HUAC hearings, an 11-month prison sentence, black market screenplay writing for the King Brothers, two Oscar wins under pseudonyms, and the ending of the blacklist due to Spartacus (1960). And superficiality might be the most appropriate word for McNamara’s script as these series of events in history pass us by like a steady inconsequential stream. Even Trumbo’s ideological drive or emotional investment in his beliefs is flippantly handled with insincere posturing as he tells his daughter she’s a communist if she’s willing to share her sandwich with a hungry schoolmate (a reductive oversimplification that doesn’t begin to show the embattled political thinker he was). It also lacks a great deal of subtlety as the dialogue bludgeons the audience with hokey diatribes and witless one-liners that overtly punctuate scenes with a blatant disregard for the audience’s intelligence. There’s simply no human heart or energetic pulse throughout the glossy proceedings that make up Trumbo—a staged recreation of questionable history that’s filled with exaggerated characters, phony unbelievable dialogue, and a thin message that even the film can’t embrace to its fullest. “There’s a good story in there somewhere,” states Kirk Douglas (Dean O’Gorman) to Trumbo, and that certainly could have been true if the film was as passionate, intellectually engaged, and confident as the historical material demands. There’s something so artificial about the thematically purposeful dialogue and deep focus on one-liner witticisms that you can’t help but celebrate the self-aware line from composite character Arlen Hird (Louis C.K. ), “Jesus, do you have to say everything like it’s going to be chiseled on a rock?” It’s an acknowledgement of a problem, but it persists throughout the film to the detriment of the performances. 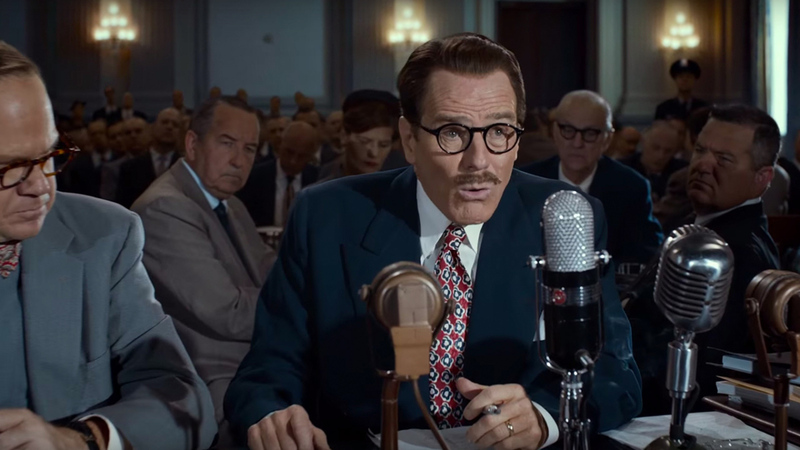 Cranston’s abilities as an actor partially allows him to find some emotional core in the film’s portrayal of dogged survival against injustice, but hiding behind a mustache, glasses, and a barrage of utterances that sound like pure Golden-Age-of-Cinema movie dialogue diminishes his humanity and the struggle. His best moments are when he’s able to drop the charade of Trumbo and embrace a performance, most notably a brief scene in the prison where he’s stripped down and for a moment we’re experiencing humiliation with him. The other sequence where he shines is in the famed screenwriter’s 1970 WGA Speech where he famously lamented about the era of the blacklist that “there were no heroes or villains, only victims.” It’s a summarizing line that should have been immaculately regarded to drive home the film’s message, but instead the line serves as an ironic contradiction to Jay Roach’s black and white simplicity. Villains—such as gossip columnist Hedda Hopper (a one-note Helen Mirren), John Wayne (an impersonating David James Elliott), and turncoat Edward G. Robinson (an underperforming Michael Stuhlbarg)—are portrayed with chortling obviousness somehow negating any historical context, philosophical earnestness, or simple character complexity. And the heroes from Trumbo to Hird to even the capitalistic motivation protections of the King Brothers (a scene-stealing John Goodman and Stephen Root) are equally flattened by a refusal to complicate their characters or their motivations. It shows a disingenuousness from Roach who tried to mask the film’s veneer and its blandness of moral inquiry. Jay Roach has recently transitioned into apolitical criticisms of our political landscape, such as with his serious minded HBO adaptations Recount (2008) and Game Change (2012). Unfortunately, Trumbo more or less represents a devolution into his loud, low-demographic aiming comedies, including Meet the Parents (2000) and Austin Powers: International Man of Mystery (1997). 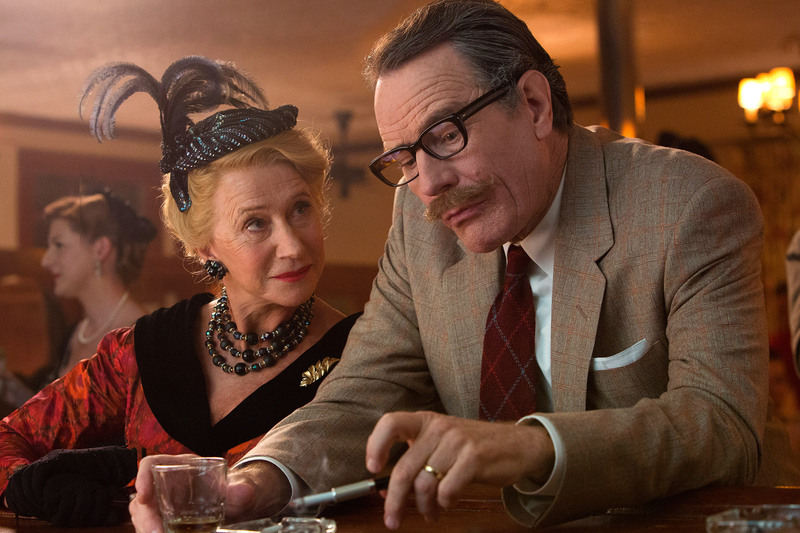 Just like with Roach’s comedies, everything in Trumbo becomes subordinate to Cranston as lead, even though the material in the script doesn’t give the proper human foundation for the film to be carried by pure performance. There’s some virtuosic acting that’s being displayed—especially by Cranston with the mannerisms and verbal inflections—but there’s no denying that it’s equally hammy in delivery thanks to Roach’s exaggerated sensibilities. Certainly there are tiny details that Roach gets right, especially in regards to some clever technical recreations from the HUAC hearings—seamlessly blending newsreel testimony with shot footage—as well as an interesting black-and-white sequence from an Edward G. Robinson gangster flick and even the purity of the period piece settings and costumes. However, the rest of the visual palette, created in part by cinematographer Jim Denault, suffers from flat box framing and a washed out colors. It might be accurate to accuse Trumbo of looking, feeling, and acting like an HBO movie, but that would be insulting to Todd Haynes’ Mildred Pierce (2011) and Lisa Cholodenko’s Olive Kitteridge (2014) that actually possessed personal visual language. Trumbo was a film that had everything from historical ire to sympathetic justice aiding its every move, and yet, McNamara’s flat script and Roach’s unpolished direction made sure that the film became too superficial to remember. The paranoia of the Red Scare, the shameful tactics of the blacklist, and the persecution of private beliefs has become an unconscionable blight on our history. It’s a blight that continues in new forms, both left and right, in our modern age, becoming a sorrowful lesson unlearned as individuals are targeted, bullied, and forced to accept a homogeneous conscience and thought. Had the filmmakers took the lessons of the blacklist and showed them with passion, insight, and confidence in Trumbo it very well could have established itself as an important film. Unfortunately, the filmmakers created a glossy, artificial historical revision that fails to ignite either a sense of historical ire or an accurate lesson to be taken. Dalton Trumbo—though at times hypocritically flawed—was one of the few who stood up against injustice, refused to be victimized, and continued his fight in the shadows against a government that belittled his stature, his beliefs, and his craft. It’s a heroic story that deserves the proper historical context, moral insight, and brave interpretation that simply doesn’t exist in Jay Roach’s Trumbo. Roach’s film doesn’t paint the eloquent portrait of the complex man that fought tirelessly, almost to the point of familial decay, against forces that seemed more and more unstoppable. Any questions we had about what drove the man ideologically, emotionally, or personally are never answered with adequate consideration. A deserving biopic would have ventured Trumbo’s creative process (not just show his peculiar bathtub setting), his ideological motives (not just simplistic platitudes and flippant lessons), and showed the depth of his struggles (not simply a comedic shadow black market game). That’s the story that’s still waiting in the shadows and the one that the creative screenwriter and devout communist deserved.